Last summer I asked my colleagues at the Division of Cultural Affairs to recall and share their first experiences in the arts. Originally posted on the Division of Cultural Affairs website, I wanted to share this post on the Culture Builds Florida blog. I would love to say my first arts experience was shaking my bum to the Beatles and Simon and Garfunkel music in the 1960s, however, I would have to say my first REAL arts experience was in December 1968. Mother drove me from Griffin, GA to Atlanta for a matinée performance of Atlanta Ballet’s Nutcracker at the historic Fox Theatre. Mother bought me a corsage for my winter coat, and we got dressed up and went out to lunch at the hotel across the street from the Fox. Afterwards, we headed over to the theatre. I was absolutely in awe. Not only was the theatre stunning, with twinkling stars like a night sky on the ceiling, but to this day I can still remember the sets, costumes, the Atlanta Symphony Orchestra conducted by Robert Shaw and wanting to be Clara! I was hooked from then on. After much begging, at age eight, my parents relented and I started ballet classes in Orlando with the Royal School of Dance. After that, I was never far from a dance studio! And today, the arts live on, in my writing, my painting, my job, and through two daughters who also love the arts. I was fortunate as a kid growing up in Manhattan with a huge city all around me to actually have a great-aunt who was a lifetime member of several important institutions including the Museum of Modern Art, the Museum of Natural History and the New York Historical Society. Each year, my grand aunt would give me a large raft of tickets and a membership card, which launched me on a voyage to meet some of the world’s great minds. On Saturdays, beginning about age 14, I took the bus or rode the subway to join others in a special presentation group at one of these sites. Those were amazing mornings, with the opportunity to see people like Norman Rockwell and Andrew Wyeth, along with many modern artists, plus scientists like Margaret Mead and Louis Leakey, including one of Jane Goodall’s first presentations of her work in Africa. I was usually the youngest one there, with my brown bag lunch and limited allowance for transportation. Following the lectures, I would have an hour or two to explore the cavernous halls and galleries of these places, discovering new things every time I went there. These experiences got me excited about art and history at an early age, along with learning what belonging to a museum could bring to your life. Afterwards, I would head to my grand aunt’s apartment and tell her what I’d witnessed. She wanted every detail, and questioned me minutely over tea and cookies. I realized later that she was able to have two experiences for the price of each one of those tickets: teaching a boy about his cultural heritage, while guaranteeing regular visits from me. It was a perfect fit. 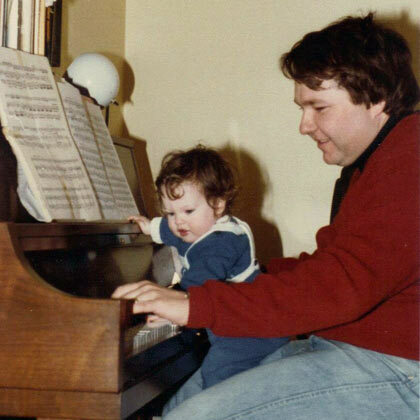 They’re not moments I can recall, but my baby book reveals my first musical experiences in photos: me as a baby, atop my dad’s lap on the piano bench. I didn’t become a great pianist like my dad, but by fifth grade I was poised to become a full-fledged clarinet playing band nerd. Music has been a mainstay in my life since that time. Thanks to music and art, I’ve forged incredible and lasting relationships, traveled the world, learned about discipline, determination and how to approach situations creatively, and found a fulfilling career. These days my husband (another musician) and I are introducing our baby to the arts. The cycle begins again! Well, my mother will tell you that I arrived performing and haven’t stopped since, but my very first arts experience is hard to pin down. Our house was filled with music – my father wired opera into every room – and he collected Roman architectural pieces and sculpture. But creating characters always appealed to me more than anything. I was the kid on the block who directed plays in our garage for the neighbors – and charged admission – so my parents figured out I was a theatre geek and enrolled me in my first formal acting training program in 1962 – the local children’s theatre – where I debuted as the Ogre in a production of Puss in Boots. 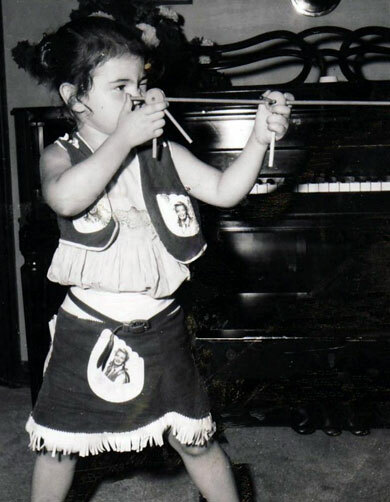 This is an early photo of me as a cowgirl – I built all my props; in this case, I used Tinker Toys to make the rifle. My father was a carpenter and my mother a painter. The smell of sawdust and oil paints was my very first encounter with the arts. I’m sure my first actual arts experience was way too early for me to remember. However, my earliest arts memory was that of a marionette show. The stage in the school’s auditorium was pitch black and all of a sudden beautiful figures appeared floating across the stage. I remember thinking “how on earth is this happening? !” The colors were mesmerizing, the music was electrifying and the feeling was amazing. It was the magic of theatre and I was hooked for life! We all know my training is not in the arts, although I took seven years of piano lessons (after maybe two lessons in ballet) and played first chair clarinet in the high school band. I’ve never taken any of that into a professional (or even armature) career. My mother was the artist in the family, having been trained as a commercial artist. While she sketched and painted all through my childhood, she mostly taught knitting to bored housewives (and a few husbands) in the many knitting shops that she owned and operated throughout and after my growing up years. Though it’s not my earliest memory, I have a clear image of myself sitting in the middle of my new bedroom floor at about three years of age, with a spool of thread and a pair of tapestry needles, trying to figure out how to cast on stitches. My mother caught me just as I about had it figured out and took everything away from me (which made me very mad – probably why I remember it so well ). She decided I was too young to learn knitting but immediately taught me to crochet, and after a rather large rug project relented and taught me to knit. I am a knitter to this day, and am currently working at a fingerless glove pattern as well as making shawls for Christmas presents this year. Along with the cooking arts, it’s what I do, in addition writing. The arts were always a part of my life since my mother was a music professor and also taught voice at home. My parents were in a renaissance group and I would go to most of the performances. I would help my mother get dressed in her costumes before they performed. She was the soprano in the group and played the recorder and my father played the Sackbut. I took my first art lessons when I was about five from a local artist/professor during the summer with a couple other kids. Her garage studio was painted on the outside in fabulous brightly colored designs. She made these colorful textile sculptures that she had hanging in her house. Recently my parents brought me one of the paintings that I made in those classes. They had it framed and it hung in their house for 30 some years. I went to the Smithsonian Hirshhorn Museum and Sculpture Garden around that time and I can still visualize the exhibition space and the color field paintings I was looking at. I thought they were amazing and gigantic! My parents couldn’t get me out of that exhibit! My father owned an auto body repair shop and could draw but was usually too tired from hammering out dents to draw for me. One day he brought home a Ford show room easel with the current year’s models in bright colors. By turning the pages over, I found my own canvas for drawing. And I did! I copied Mickey Mouse characters from a comic book. I remember the freedom and the exuberance of being able to draw on such a large scale and I was good! I seemed to have inherited my father’s talent. 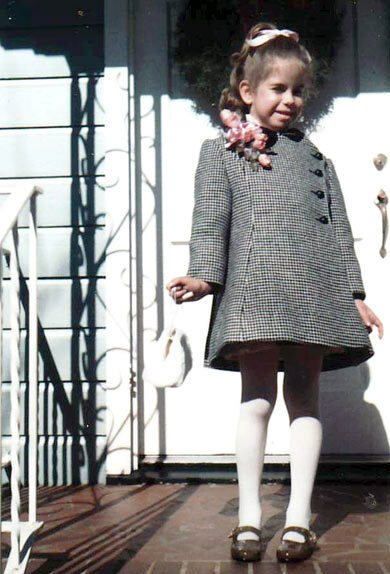 From there, I went on to draw my own paper dolls and designed entire wardrobes with my own sense of color. I should mention that I invented the combination of lime green and pink before Lily Pulitzer! I saw my first theatre production at an Orlando supper club courtesy of my sophomore high school teacher and fell in love with the theater then and there. I went on to perform in the senior play as a sophomore when one of the cast members broke a leg. I was the stage manager and had two days to memorize the lines. It was a small part where I played a tipsy old lady. The audience laughed at the appropriate time and I was again enthralled. I didn’t get to an art museum until I was well into my 30s but I finally made it to the Metropolitan Museum of Art and took in my first Broadway play, Evita with Patty Luponi. Not bad for a young girl whose world was so small that she didn’t even think that she would have the opportunity to go community college, let alone a university. This entry was posted in Art Talk by culturebuildsflorida. Bookmark the permalink.